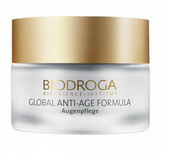 GLOBAL ANTI-AGE FORMULA with BIOACTIVE ANTI-AGE COMPLEX(Argania phyto stem cells and biopeptides) was particularly developedfor these deficits. Inspired by nature, the formation of new skin cells andskin’s own elastin are stimulated by means of the innovative EDP (peptides).The concentration of natural hyaluronic acid is improved, and themoisture depots of skin are replenished. Skin becomes tighter and moreelastic again, fine lines and wrinkles are diminished and facial featuresre-contoured.